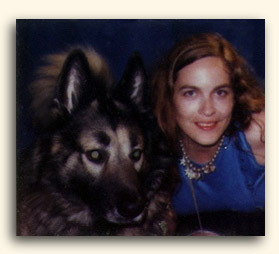 The American Dog Trainers Network is the creation and life's work of Robin Kovary who passed away January 6, 2001. She gave her spirit, care, concern, expertise, and time to this endeavor. Robin was a contributor to many humane causes and to all living things. She went out of her way to help virtually anyone who needed help, and at any cost to herself. This website is a reflection of her giving spirit: It is her gift to us, her contribution to dogs, and her legacy. Three people were named and entrusted with the care of the site by Robin: Karen Miller, Dennis Owens, and Lori Sash-Gail, all professional dog trainers. Contributions from Robin's former clients and friends have made it possible to continue the site. If you wish to make a donation, please e-mail Karen Miller at vizsla@earthlink.net . The helpline which was also maintained by Robin is currently not in operation. in ANY e-mail correspondence ! !